Buffalo Rib Steak Vs. Beef Rib Steak. In order to test what makes the best steak—Bison meat Vs Beef, we decided to have a Summer Meat Festival! Friends and family got to taste various cuts of Bison and Beef meat so that they could nominate which makes the Best Steak! 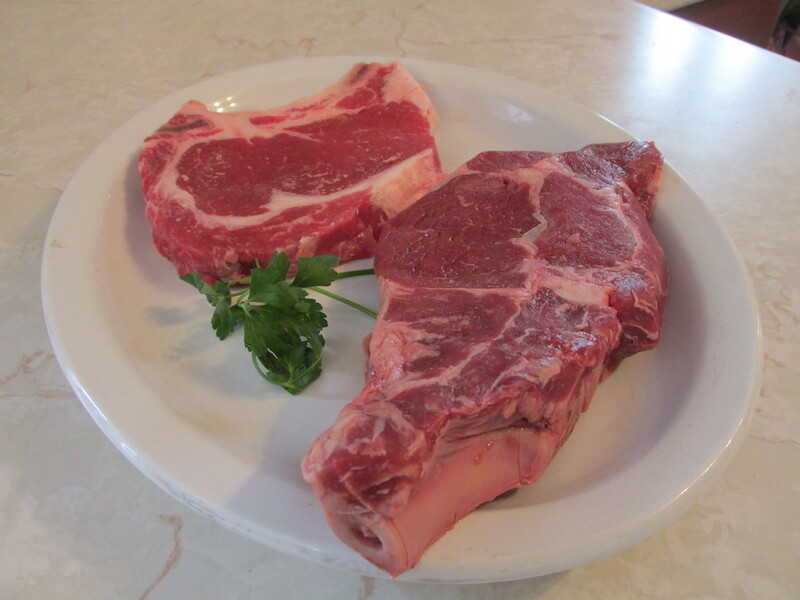 We put standard rib steaks head to head with bison rib steaks as well as three other cuts of bison. Everything was good, but read on to find out what steak was our favorite. The meat prep was simple. As you know, we love our old Weber Kettle grill and, being meat lovers, we like to keep any additional strong flavors such as barbecue sauces or hot spices out of our recipes. 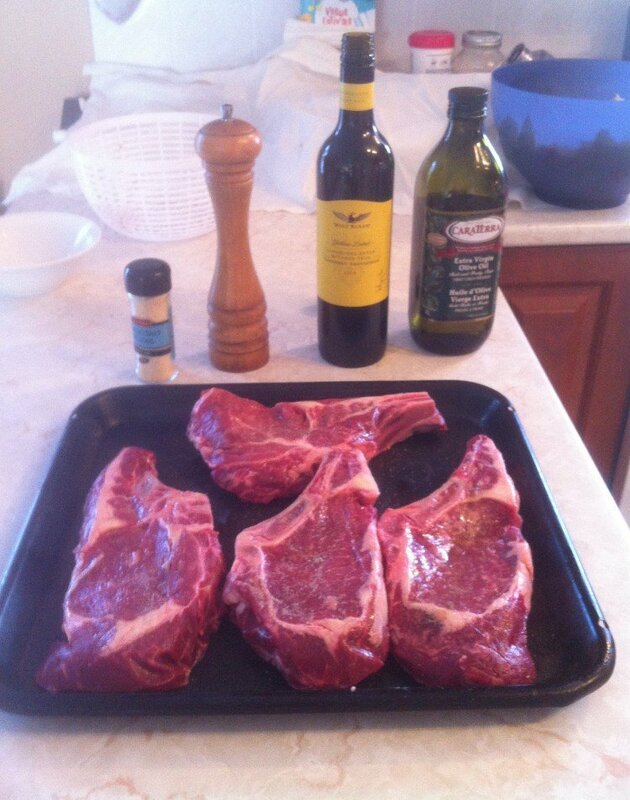 We therefore prepped our meats with a simple splash of garlic salt and a good quality olive oil. Having great quality meat helps! Choosing great cuts and, when possible, all natural meat makes it easier to prepare simple and quick delicious recipes. We hosted a big event with effectively very little effort. Prepping the meat took less than 20 minutes—even if it was a large amount of meat! Cooking time was also very short: 10 minutes or less. With the relatively high heat of natural charcoal the steaks cooked fast. We used the same prepping and cooking time for the beef steaks a we did for the bison steaks. We however decided to trim the rib beef steaks (remove the excessive fat). This was not required with the naturally lean buffalo steaks. When cooking beef steaks we grilled them for about 5 minutes on one side then added more mesquite wood chips before turning them over to grill for another few minutes on the second side. Okay, now that we’ve provided you with the steak cooking details, you are probably wondering: how did it all taste??? The filet mignon is very lean so we opted for cooking them in a cast iron skillet with a little butter instead. of putting them on the grill. 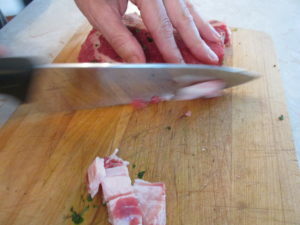 We then sliced the cooked meat into strips and served it as an appetizer. The result was so delicious that we ended up eating all of it before we even got to the table! The first steak was a definite success and got everyone excited for the rest of the steaks to follow. Tip: Serve this buffalo steak with a cabernet sauvignon and you’ll make a lot of friends! This steak was delicious! Less lean than its brothers: the other bison cuts, yet far less fatty than its cousin the beef rib steak, this is a steak to be served quickly as it looses too much of its great taste if served at room temperature. You want to enjoy the succulent juiciness while the natural meat is hot. As with any steak – let it rest for a few minutes before cutting, but not more than 5 minutes in this case. 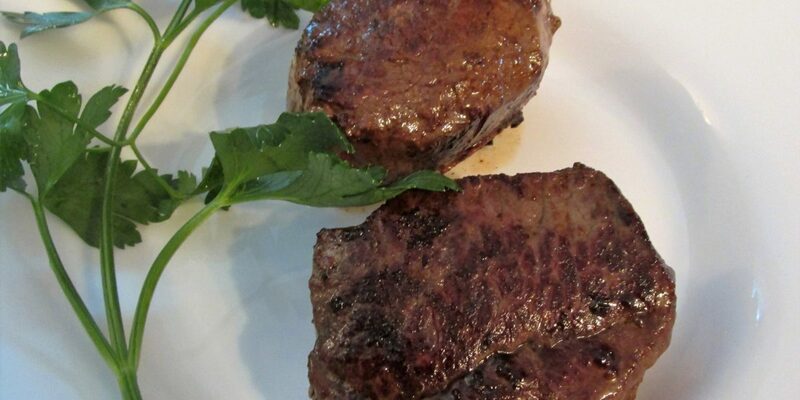 Meat lovers who are looking for a “low in fat option” will love the Bison Top Sirloin. It is tasty and practically fat free. Enjoy the firmer texture of the natural meat. Sink your teeth in and feel wild America in your mouth. The Bison Strip loin had the wildest taste out of all the buffalo steak cuts. This steak could be a good choice for a marinade to complement the flavor. Definitely a good pairing with the cabernet we were drinking. 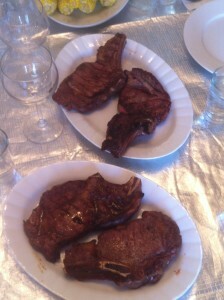 Although all the beef rib steaks were good, they did not compare in flavour and texture to the Bison steaks. They did have the benefit of a higher fat content that makes them a little more forgiving on the grill – but the overall impression was that of a more blander juiciness when compared to the buffalo rib steaks. Best Steak: The Buffalo Rib Steak! 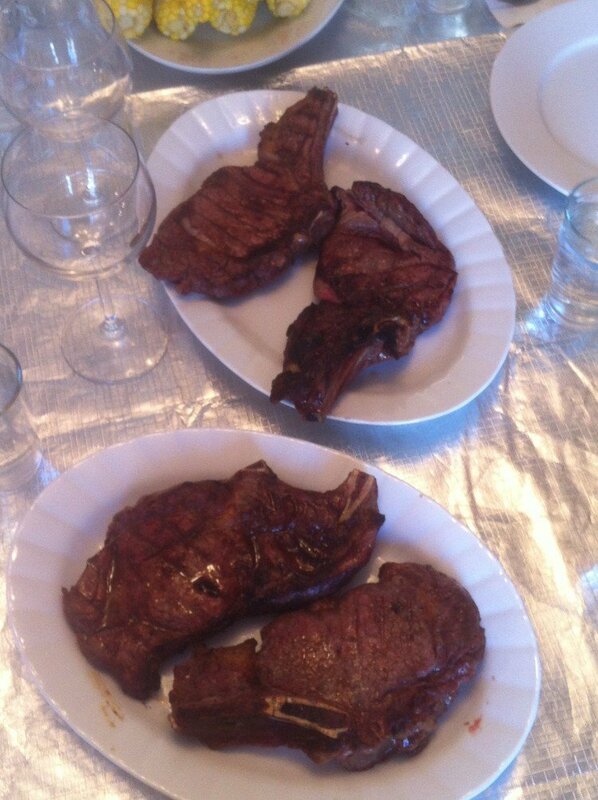 Although all meat was good, nothing compared to the savoury taste of the Buffalo Rib Steak. The immediate hint of the mesquite wood chips exploded into a tasty, and very juicy, wild flavor. The Buffalo Rib Steak was mouth-watering. We definitely recommend it to all meat lovers out there. Pair it with a good wine and you’ve got yourself a feast that cannot be beat! A meat cook-off is a great way to enjoy good food and good company. So fire-up the grill and enjoy your summer! 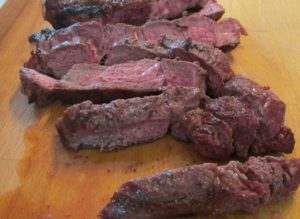 You can get a bison steak at a restaurant, but even the best restaurant will have a hard time beating what you can do at home with a simple charcoal grill and a good piece of bison meat. This article will show you what we feel is one of the best ways to cook a buffalo steak – and you will see why we say that your best option is to buy buffalo steaks online and grill them at home yourself. 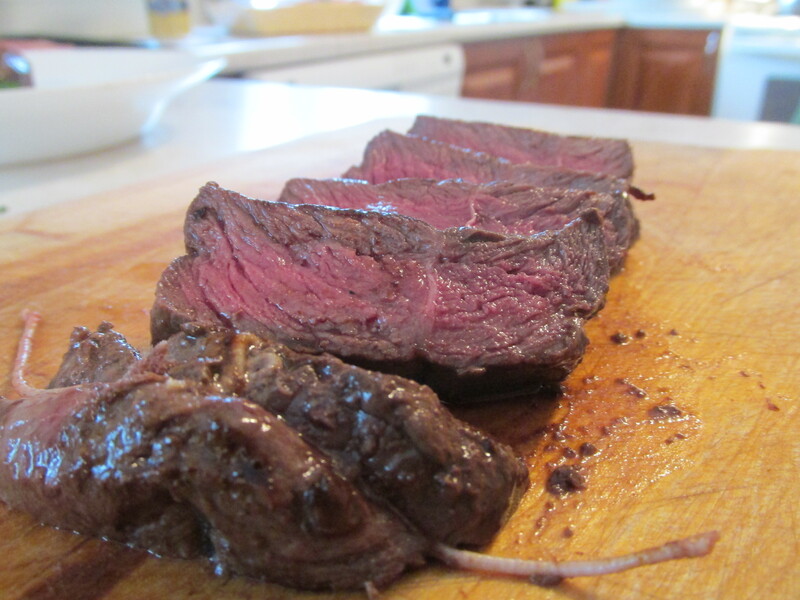 All natural bison meat is best enjoyed with a simple recipe like this one. Here you can see the starting positions of our Weber Kettle charcoal grill and our buffalo steaks. Got a match? Natural lump charcoal is in our lighting chimney with just a bit of newspaper for tinder underneath. It will take about 20 minutes for the fire to be ready. Our buffalo rib-eye steaks have come out of the fridge and are ready for seasoning. Once we light the bbq we will get them organized. No lighter fluid is necessary when using a chimney like this, so our meat will be free of any chemical taint. This is the only way to treat all natural bison meat. We will use natural charcoal for heat, and a hardwood log will also be added to the grill before we put the meat on, and this will add a wood smoke flavour to the meat. Adding a small log (or wood chips) is a great way to get the ease of use (and higher heat) of charcoal while still getting the awesome flavour of wood grilled buffalo steak. Once the fire is lit it’s time to prepare the bison meat for the fire. In the photo above you can see the ingredients in this simple and tasty recipe – garlic salt, black pepper, olive oil, and red wine – and the wine is just for the chef to drink! 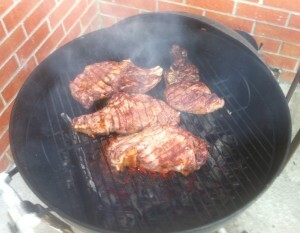 Here are our buffalo rib steaks with a dusting of garlic salt and black pepper. You can put as much as you like as a lot of the seasoning will be lost on the grill. 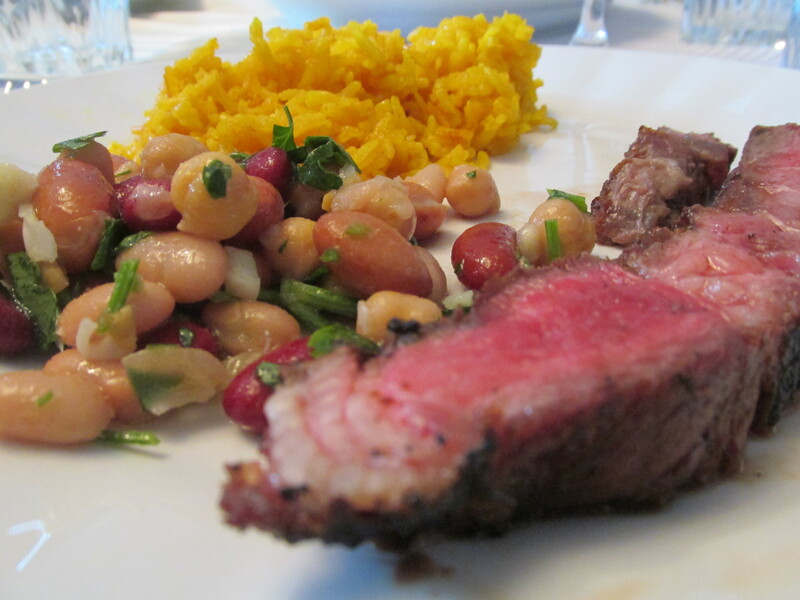 You just need a few drops of olive oil per steak to ensure that they don’t stick to the grill. 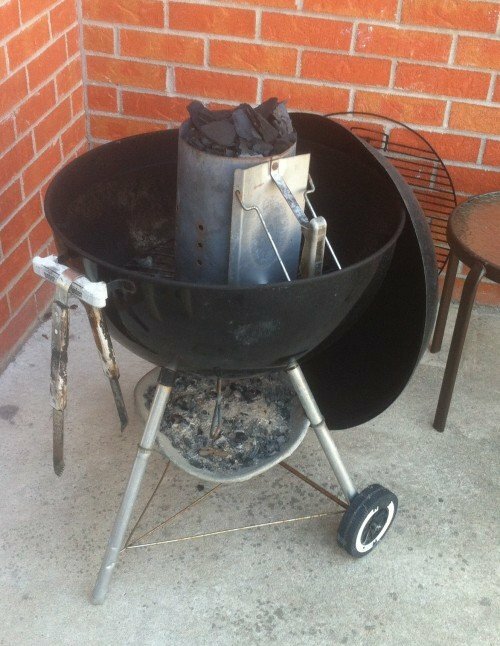 Our barbecue pro has some tips for those of you who will do this at home. Enjoy! Wood log blazes as meat arrives on the grill. 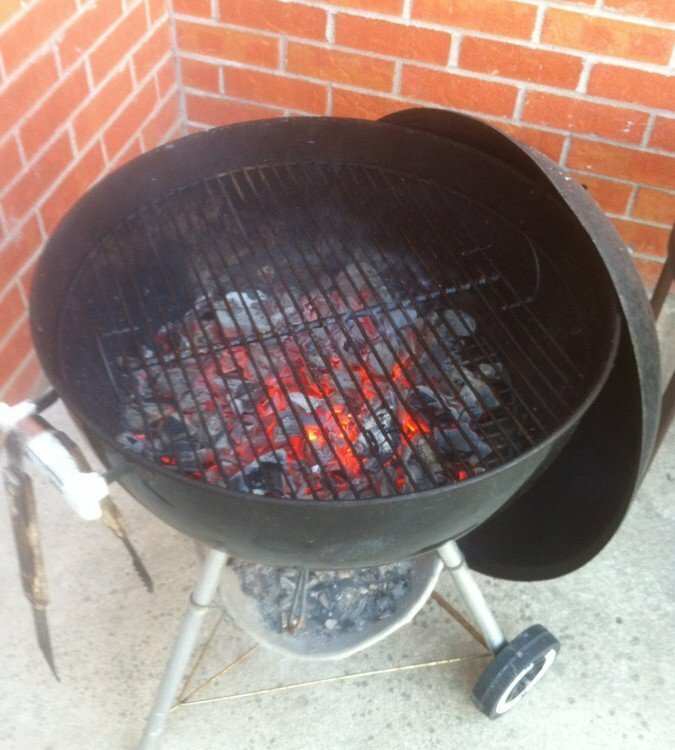 The steaks have been just been fired (put on the grill) in the image at left below. You can see the yellow flame to the left of the steaks and this is a small hardwood log that was put in beside the hot charcoal before the steaks went on. The hardwood will give our bison meat the wild taste of wood smoke. You can also use wood chips. Just be sure that your wood is not underneath your meat so that you don’t burn it, as the wood will flare up a lot more than the charcoal. Alternatively you could build an all-wood fire to grill your buffalo steaks – but that will be another post. 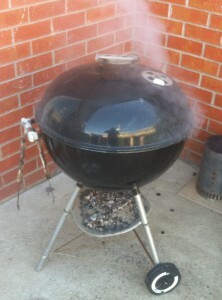 Side 1 cooks with the top on – wood smoke smells awesome. Once the meat has been seared by the super hot fire we put the top on the kettle in order to prevent the meat from burning, control flare-ups, and to give the meat full exposure to the wood smoke. Flare-ups can occur when liquified fat falls onto the charcoal and the relatively lean bison presents less of a problem than a fattier beef rib steak. The first side will cook about 4 minutes – 2 minutes with the top off and another 2 minutes with the top on while they bathe in wood smoke. Turn your steaks at 4 minutes. One of the other benefits of putting the top on the grill is that when you remove it to turn the meat your fire will have cooled a little permitting you to turn your meat without feeling the heat too much. The fire will heat right back up once the top is removed for searing the second side. 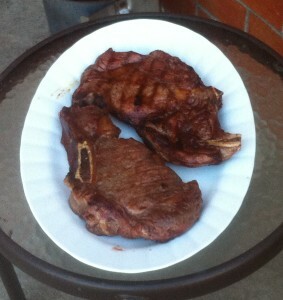 Buffalo steaks cooked on first side. 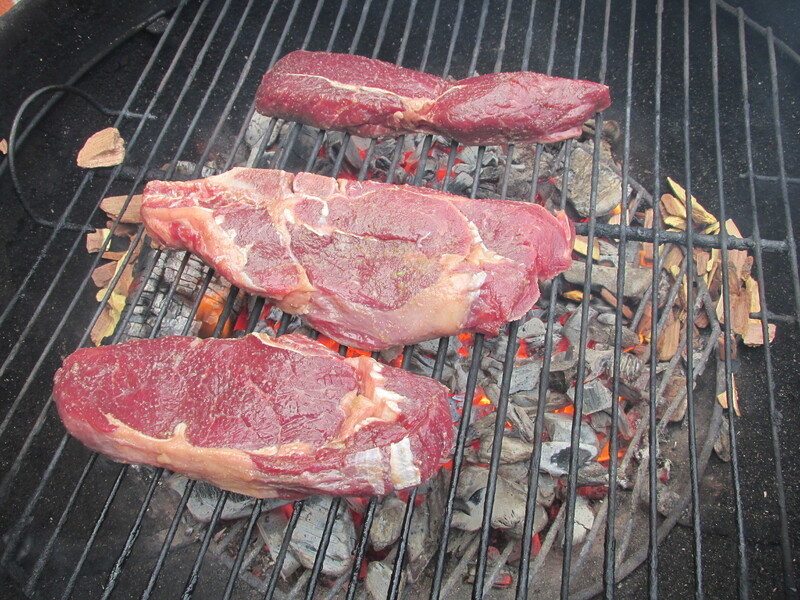 As you turn the meat rotate the bison steak positions on the grill to even out the heat exposure. Place those steaks that are more browned in the place of those that appear a bit less cooked. 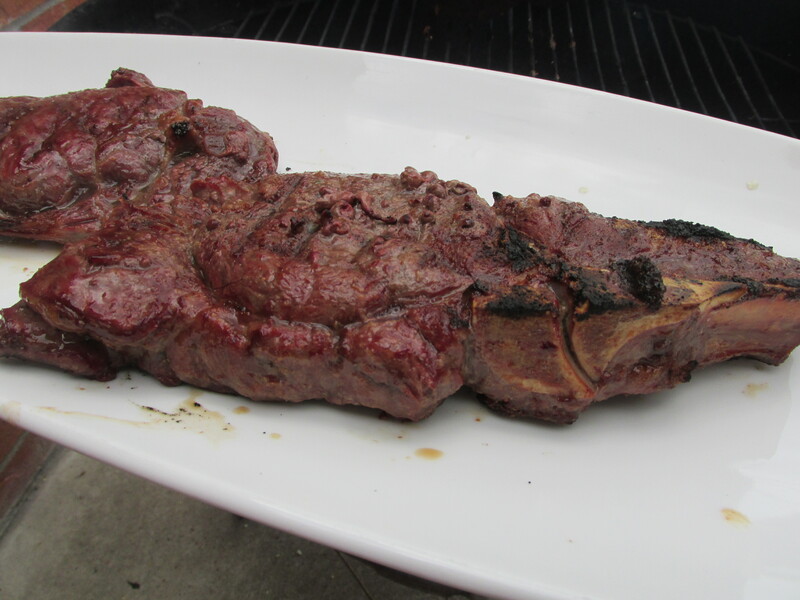 Rotating your meat in the hot spots will prevent any one steak from getting overdone. Like with side 1, start cooking with the top off your grill and put it on when (if) the fire gets too hot. The second side can be done as fast as 3 minutes (if you want your meat rare) and not longer than 4, as your premium grass-fed buffalo steaks will be at their best rare or medium rare. Even if you normally eat your steak medium, try your bison meat medium rare. Trust me. Serving Your Bison Steak – Bon Appetit! 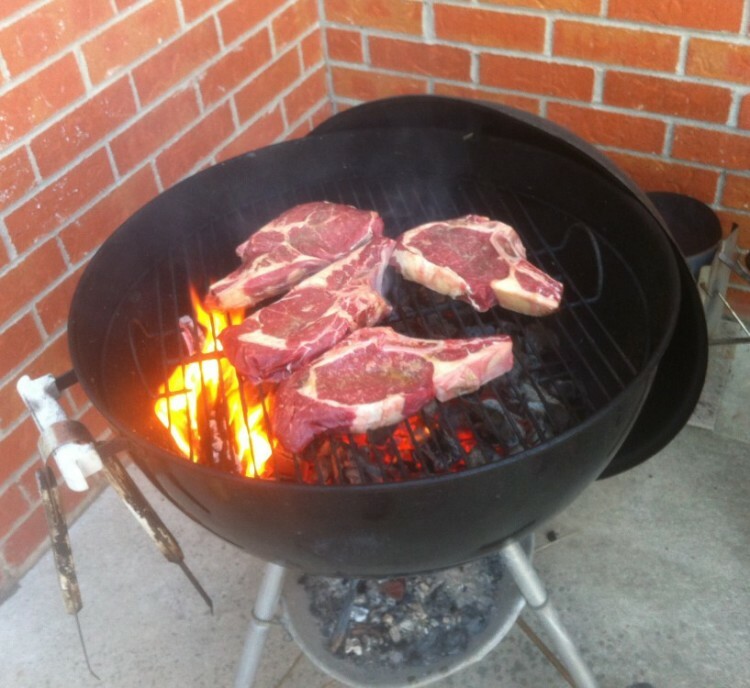 Take your steaks off the grill after a total of 6 – 8 minutes, when they reach your desired “cuisson”. We could write a book on how to judge steak doneness on the grill. If you don’t have an experienced finger for a touch test, you can go strictly by time. Our suggested timing here assumes that your grill is very hot. Let your steaks rest for up to 10 minutes before carving or serving them. The minimum resting time is 5 minutes because you will lose much more juice if you cut the bison meat before 5 minutes than after. Check out this article on resting times if you are interested to understand more. Finally, set the table and impress your family (and guests) with a great presentation of the succulent buffalo steaks. 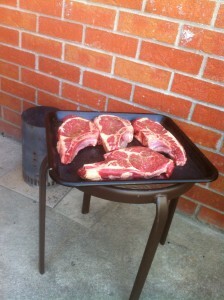 Here you can see how we showed off a bit before cutting the steaks for serving. Now dig in and enjoy! Dinner is ready. 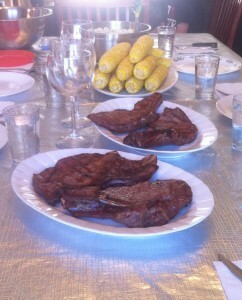 Bison steaks and corn.